Updates on news, events and all the goings-on at Spectrum cgl. We've always maintained that working here is about more than having a job. Empathy & experience combine to make our recovery workers effective listeners. With that in mind, we're proud to say that 33% of our current paid staff started out as volunteers and 16% have gone through treatment with us as service users. Many people suffer from combined mental health and substance misuse problems (dual diagnosis). Following popular demand, members of staff in Stevenage, Hertford, Hatfield and Watford will be delivering auricular acupuncture for clients once a week to help them manage stress and relieve cravings. Service users, staff and members of the public have access to smoking cessation clinics at our service every Tuesday at 12pm, delivered by the Hertfordshire Stop Smoking Service. 21 local residents have quit since engaging with the service. 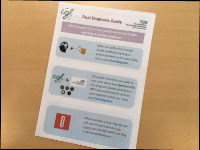 Our Hospital Liaison Team are now offering anti-opiate overdose medication Naloxone to patients being discharged from the acute mental health unit at Kingsley Green. Liaison team members Lucy Sheppard and Michelle Wood attend the unit on Mondays and Fridays and will also offer the potentially life-saving medication to family members and friends of vulnerable patients. CGL as an organisation has gone up 89 points on the Stonewall Workplace Equality Index as a result of improved inclusion activities. Remember: we offer an 8-week programme for friends, family and anyone who cares for someone with a substance misuse issue. Our Nurse Clinical Lead AnnaMarie Felice has spoken to Relax Back UK about the potential issues arising from opioid use to treat back pain. We hold multiple open days, training sessions and information events throughout the year. Join us at the Hatfield Market Place on Saturday 14th April from 9am - 3pm where we'll be answering your questions on drug & alcohol support. Recovery Worker Sarah and Volunteer/ Inclusion Champion Andrea will be at the Royston Leisure Centre on Saturday 21st April 10am - 2pm. Hospital Liaison team leader Lucy and Communications Officer Sam will be on hand to give out advice to patients and carers on substance misuse treatment at Holywell Community Centre on the 24th April from 10.30am - 2pm.